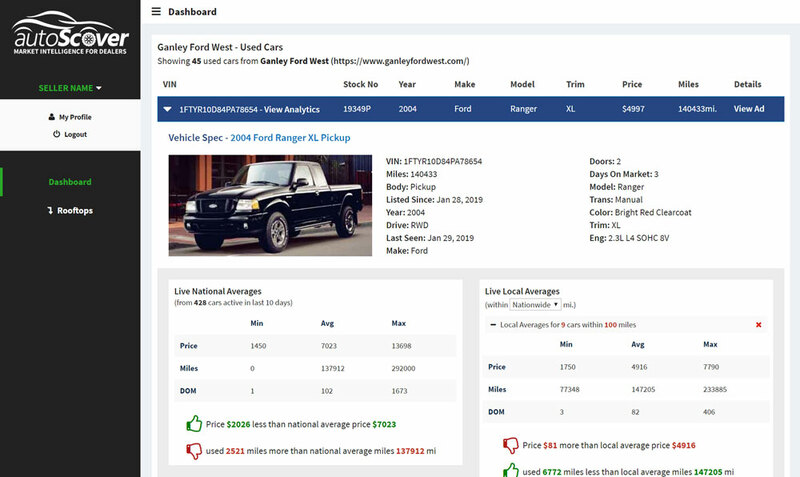 AutoScover gives you access to live market data, competitive intelligence, vehicle pricing tools and much more with our custom reports feature. Need a custom report or module to give you the data you need to make profitable decisions in your business? Reach out and we will build it for you. Unlike others, we believe that every used car dealer should have access to real-time market data to help make faster and profitable decisions to run their business. This is why AutoScover is a fraction of the cost of similar tools in the market. With over 70 data-points to choose from we can create custom reports and info graphs to help with your data-driven decisions. Export them, print them, share them with your team and if you need a custom solution just let us know and we’ll get it done. Give our software a try risk-free for 7 days (No credit card required). © AutoScover.com - 2019. All Rights Reserved.